A quick way to save and send links. Save links from any app to view later. Send links between your devices with a single tap. Most of the bookmarking apps rely on share button to save links. Facebook, Twitter, WhatsApp - the apps where you spend most of the time don't have share button for links. With Voblet you can save by copying the link. Single tap will open the link in your favorite browser. Double tap will save the link. 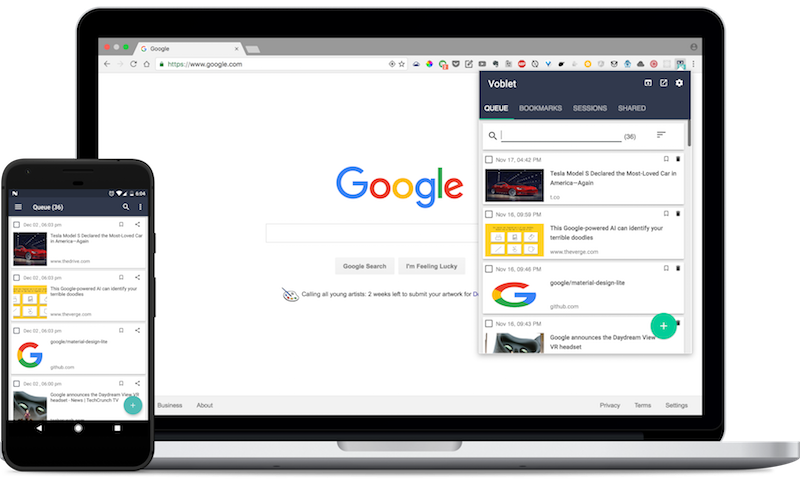 You need to set voblet as default browser for this feature to work. Voblet connects your devices. Open a link on computer with just a tap from your phone. No need to email links or open web versions of messenger apps. Voblet connects your devices. Send links from browser to your phone. Open a link on computer with just a tap from your phone. No need to email links or open web versions of messenger apps. Easily add bookmarks from any app. Use favorites, tags to organize your bookmarks. Links added to Voblet can be accessed from your phone, tablet and computer. Everything you add to Voblet syncs across your devices.